Chadians living in Europe have demonstrated in Paris and Berlin in recent weeks to protest against French strikes in Chad. The strikes on 3 February, at the request of N'Djamena, were to prevent a rebel group from toppling President Idriss Deby. However they have sparked accusations of French interference and once again cast an unfavourable light on France's African policy. Waving the bright blue, yellow and red colours of Chad's national flag, dozens of demonstrators protested in front of the National Assembly in Paris on 7 March with many calling on the French government to end its support for Deby. "Stop the bombing campaign," they shouted, while others shook slogans accusing the French president Emmanuel Macron of neocolonialism. On 3 February, at the request of N'Djamena, planes from the French Operation Barkhane launched strikes against a group of Chadian rebels in the north-east of the country, thwarting an attempt to unseat Deby after nearly two decades in power. France says it maintains the 4,500 Barkhane force in the Sahel region to fight armed Islamists. Critics of the February attack point out that its victims were anti-Deby rebels, not jihadists. Among the crowds, mainly members of Chad's diaspora - roughly 20,000 in Europe - are a handful of MPs, attracted by the noise outside parliament, and who decide to take part in the protest. "We are not stupid," Eric Coquerel, a member of Jean-Luc Melenchon's Unbowed France party, bellows into a microphone offered to him by activists. "Just days before Emmanuel Macron's visit to N'Djamena, Benalla showed up. If this is not Françafrique, I don't know what is!" The visit of Alexandre Benalla - Macron's former security aide - to Chad with business leaders, has sparked speculation of backroom dealings reminiscent of the tradition of parallel diplomacy in Africa known as Françafrique. Macron came to power in 2017 promising to end the policy. But the incursion by the Union of Resistance Forces (UFR) into Chad from Libya last month, saw France fly to Deby's rescue, sparking criticism it is propping up its former colony. The Chadian rebel group created in 2009, tried to overthrow Deby in 2008 but was repelled by national forces backed by French logistical support. France's ministry of defence has denied allegations of interference. It says the intervention on 3 February was in response to a formal request for help from a sovereign country. "There is a defence agreement between France and Chad where there is engagement if there is an external threat on the country," said Jacques Maire, an MP with the ruling Republic on the Move party. "We have an alliance and we are bound to help the county to defend its borders," he told RFI. He claimed the operation in Chad was no different to the one in 2012 when French troops stormed Mali to prevent rebel groups from invading the country's north. Yet France's support for a leader accused of authoritarianism and human rights violations has stunned many in France's opposition parties. "It all seems like a pretext to give firmer support to Deby's regime," hard-left deputy Clementine Autain said during questioning of French Foreign Minister Jean-Yves Le Drian before lawmakers on 14 February. Le Drian has defended the strikes, arguing that Deby is a strong ally in the fight against Islamist militants. Indeed, Chad serves as the headquarters of Operation Barkhane, France's counter-jihadist mission in five former colonies in the Sahel and is strategically straddled between countries in Central Africa and those in North and sub-Saharan Africa. 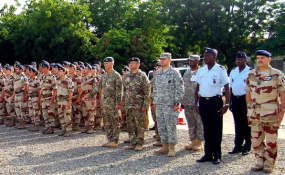 The military base in the Chadian capital of N'Djamena is absolutely vital to French troops, said François Gaulme, a researcher at the French Institute for International Relations (IFRI). "Not only do they use the base for missions but it also allows them to test and train on fighter jets flying at low altitude," he told RFI. For critics like Abdelkerim Koundougoumi Egrey, a Chadian activist and head of the Africa department at Internet Without Borders, France's support of Deby is misguided. "France thought that they are fighting against terrorism. But they fight Chadian rebels," said Egrey, who blasted officials in N'Djamena for rebranding rebels as terrorists. Rebel groups have been stepping up pressure on Deby at the country's borders, as the president struggles to contain an economic crisis and several years of social unrest. "The fight against terrorism gives Deby the right to do whatever he wants in Chad," added Egrey. He urged the French government to support the people and not an autocratic ruler who changed the constitution last year to stay on until 2033. "The main source of instability, terrorism, and insecurity in the Sahel is Idriss Deby," he added, suggesting that bad governance was likely to fuel jihadist movements, not stop them. "In the past, our British allies often reproached French diplomats for backing African strongmen unconditionally," said Gaulme. "Our answer was always: 'Better the devil you know than the one you don't know.'" Despite promises to break with Françafrique, Gaulme, who penned a paper in February called Emmanuel Macron and Africa, says Macron has become bogged down in an alliance painfully familiar with a bygone era. "We need to work with public authorities if we want to develop our actions on the field," said Maire. "It does not mean that we give a blank check to this government." One of the reasons for the 66-year-old Chadian leader's survival has been due to the lack of a credible opposition. "We can say things without interfering in the internal debate," added Maire, while acknowledging that any action would be a double-edged sword. "If we do not say anything, it means that we don't care. And if we say something it means that we manipulate. So there is a very narrow line to be defined. "We are very open to discuss rights, civil rights, democracy," he said. "We do it with our colleagues but we don't want to interfere publicly within the national debate."